Who says that girls can’t wear blue? It may not be the stereotypical choice for a little lady, but I think this gorgeous girl absolutely rocks this delicate blue headband. So feminine, so cute, totally beautiful. 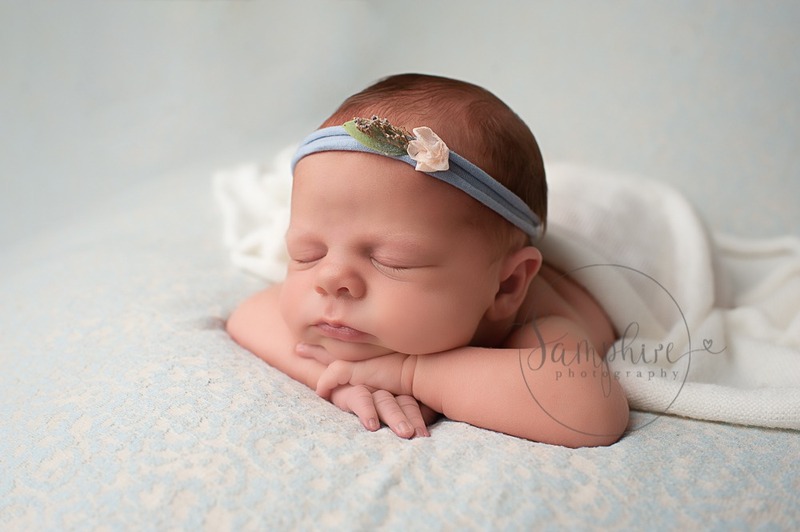 Adorable Arabella came to see me in the Samphire studio for her newborn portraits when she was just over a week old, an ideal age for a newborn session, giving us maximum opportunity to capture the adorable sleepy curled-up baby poses. 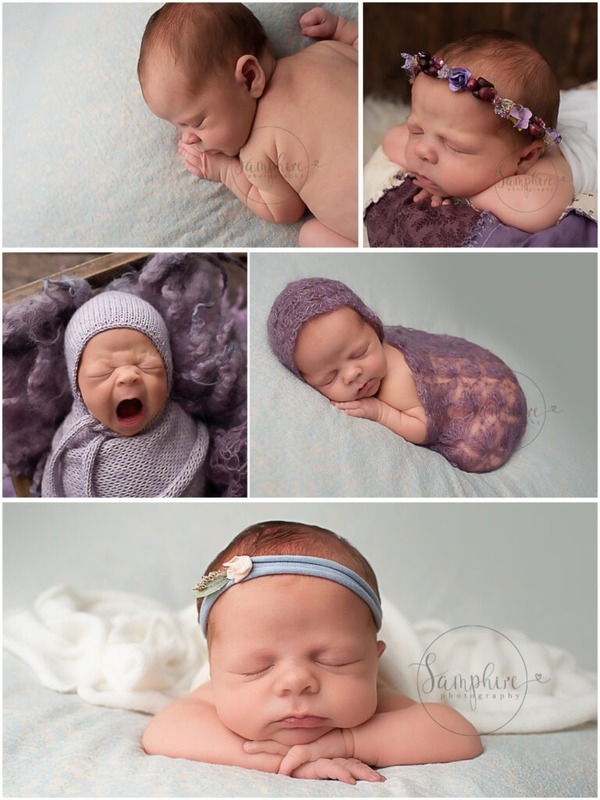 And we did just that ~ she was an absolute dream to photograph and using a super pretty mix of soft purples (with a touch of that gorgeous baby blue! ), with knits and layers and a picture perfect headband, I captured plenty of wonderful images for Mum & Dad to treasure, including close-ups of those tiny lips and lashes, fingers and toes. 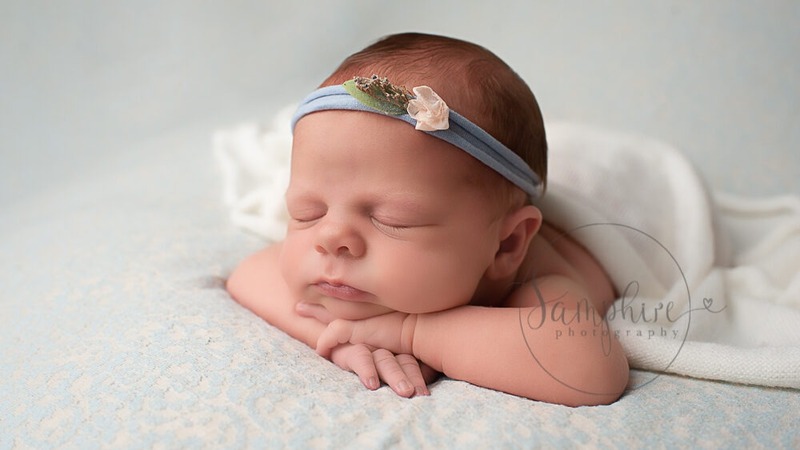 As an experienced newborn photographer I work through a series of poses with your precious little one. I take my time with these sessions to ensure that mother (and father) and baby are relaxed. Newborn sessions can last up to four hours to give plenty of time for settling your baby, top-up feeds, nappy changes, cuddles. I am also more than happy to take pictures with the parents as well. We encourage parents to get involved, and before your session we advise you on what to expect and what you need to bring with you on the day.